London got their All-Britain Junior Football Championship campaign off to an ideal start last Saturday, after they beat reigning champions Kilkenny with a four-goal rout. 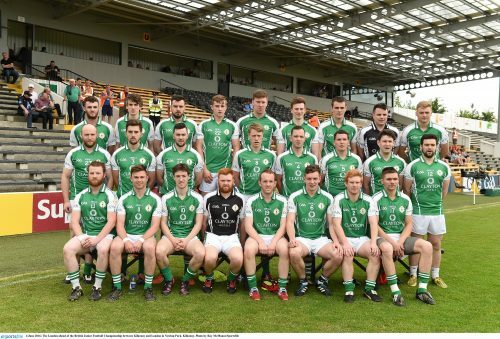 Manager Peter McNally and his players were ‘privileged’ to play in the curtain-raiser to Dublin’s game against Laois in Nowlan Park last weekend, but now that they are back in London have their focus firmly on their next game against Gloucestershire in Ruislip on Sunday. “I think it was a great joint effort between the players, the management and selectors. We got everything spot on and all pulled together which gave us the win in the end,” said McNally. “I didn’t realise that Kilkenny were favourites going in to the match, but I was confident. Maybe nine points flattered us in the end, as Kilkenny are a very good side and are well-drilled from their management down. McNally is still focusing on the game in hand, but makes no secret of his belief in his side’s ability to claim an All Ireland title this year. “We are confident, but not over confident going in to this next match. Every game is a new game and we need to take on board the last result, but move one. We haven’t achieved anything yet, and if we don’t get the result on Saturday we’ll be back to square one. “Of course we have to enjoy the journey and see where it takes us but also focus on the job in hand. I’m not in it for the fun of it, we are here to win. “From the very start the goal is to win the junior All Ireland. As far as I’m concerned we’re not here to be also-rans, and we need to aim as high as we can, otherwise there is no point in wasting out time. London’s four goals came from Alfie McNulty, James Grant, and two from John Daly (who got 2-4 overall). London-born Killian Butler also started, with Shane Buckley coming off the bench. “It was a great experience for all the boys, and we all seem to grow a couple of inches after the weekend. The fear was that we wouldn’t get a result and come back on a downer after all the effort we put in, but it will do all of the players’ confidence good to have this achievement. “The atmosphere in Nowlan Park was brilliant, and it really lifted their spirits. There was a slight apprehension if they would rise to the occasion, but they had great courage in their performance.